Upon waking this morning, I thought about the words forced onto the computer yesterday. By the time I sat before the monitor, I had convinced myself to delete the whole chapter and try again. Fortunately, I avoided the story until after I had imbued a decent dose of coffee. My thinking cleared a bit and I decided to read what I had written the day before and see what I could salvage. As it turns out, I added a few things here, changed a few things there and pretty much kept the whole thing. Afterwards, I went on to complete chapter 9. To make the quota, I also got a good start on chapter 10. Vengeance of the Ghost is still making progress. Today, instead of a stamp, I'll post an autograph. Many years ago, I was at a Sci-Con in Virginia Beach. Among the guest was this gentlemen. He was very pleasant to speak with and signed two books for me. 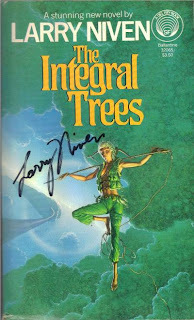 Larry Niven was one of my favorite sf writers! Cool autograph!